Pali (/ˈpɑːli/; Pāli) or Magadhan is a Middle Indo-Aryan language native to the Indian subcontinent. It is widely studied because it is the language of the Pāli Canon or Tipiṭaka, and is the sacred language of some religious texts of Hinduism and all texts of Theravāda Buddhism. The earliest archaeological evidence of the existence of canonical Pali comes from Pyu city-states inscriptions found in Burma dated to the mid 5th to mid 6th century CE. Brāhmī, Kharosthi, Khmer, Burmese, Thai, Sinhala, other Brahmi-derived scripts such as Devanagari, and transliteration to the Latin alphabet. The word Pali is used as a name for the language of the Theravada canon. According to the Pali Text Society's Dictionary,[page needed] the word seems to have its origins in commentarial traditions, wherein the Pāli (in the sense of the line of original text quoted) was distinguished from the commentary or vernacular translation that followed it in the manuscript. As such, the name of the language has caused some debate among scholars of all ages; the spelling of the name also varies, being found with both long "ā" [ɑː] and short "a" [a], and also with either a retroflex [ɭ] or non-retroflex [l] "l" sound. Both the long ā and retroflex ḷ are seen in the ISO 15919/ALA-LC rendering, Pāḷi; however, to this day there is no single, standard spelling of the term, and all four possible spellings can be found in textbooks. R. C. Childers translates the word as "series" and states that the language "bears the epithet in consequence of the perfection of its grammatical structure". In the 19th century, the British Orientalist Robert Caesar Childers argued that the true or geographical name of the Pali language was Magadhi Prakrit, and that because pāḷi means "line, row, series", the early Buddhists extended the meaning of the term to mean "a series of books", so pāḷibhāsā means "language of the texts". However, modern scholarship has regarded Pali as a mix of several Prakrit languages from around the 3rd century BCE, combined together and partially Sanskritized. The closest artifacts to Pali that have been found in India are Edicts of Ashoka found at Gujarat, in the west of India, leading some scholars to associate Pali with this region of western India. Pali, as a Middle Indo-Aryan language, is different from Sanskrit more with regard to its dialectal base than the time of its origin. A number of its morphological and lexical features show that it is not a direct continuation of Ṛgvedic Vedic Sanskrit. Instead it descends from one or more dialects that were, despite many similarities, different from Ṛgvedic. In works of Sanskrit poetics such as Daṇḍin's Kavyadarsha, it is also known by the name of Bhūtabhāṣā, an epithet which can be interpreted as 'dead language' (i.e., with no surviving speakers), or bhuta means past and bhasha means language i.e. 'a language spoken in the past'. Evidence which lends support to this interpretation is that literature in Paiśācī is fragmentary and extremely rare but may once have been common. 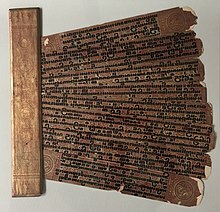 The 13th-century Tibetan historian Buton Rinchen Drub wrote that the early Buddhist schools were separated by choice of sacred language: the Mahāsāṃghikas used Prākrit, the Sarvāstivādins used Sanskrit, the Sthaviravādins used Paiśācī, and the Saṃmitīya used Apabhraṃśa. This observation has led some scholars to theorize connections between Pali and Paiśācī; Sten Konow concluded that it may have been an Indo-Aryan language spoken by Dravidian people in South India, and Alfred Master noted a number of similarities between surviving fragments and Pali morphology. Many Theravada sources refer to the Pali language as "Magadhan" or the "language of Magadha". This identification first appears in the commentaries, and may have been an attempt by Buddhists to associate themselves more closely with the Maurya Empire. But the four most important places in Buddha's life are all outside of it. It is likely that he taught in several closely related dialects of Middle Indo-Aryan, which had a high degree of mutual intelligibility. There is no attested dialect of Middle Indo-Aryan with all the features of Pali. Pali has some commonalities with both the western Ashokan Edicts at Girnar in Saurashtra, and the Central-Western Prakrit found in the eastern Hathigumpha inscription. The similarities of the Saurashtran inscriptions to the Hathigumpha inscription may be misleading because the latter suggests the Ashokan scribe may not have translated the material he received from Magadha into the vernacular. Whatever the relationship of the Buddha's speech to Pali, the canon was eventually transcribed and preserved entirely in it, while the commentarial tradition that accompanied it (according to the information provided by Buddhaghosa) was translated into Sinhala and preserved in local languages for several generations. In Sri Lanka, Pali is thought to have entered into a period of decline ending around the 4th or 5th century (as Sanskrit rose in prominence, and simultaneously, as Buddhism's adherents became a smaller portion of the subcontinent), but ultimately survived. The work of Buddhaghosa was largely responsible for its reemergence as an important scholarly language in Buddhist thought. The Visuddhimagga, and the other commentaries that Buddhaghosa compiled, codified and condensed the Sinhala commentarial tradition that had been preserved and expanded in Sri Lanka since the 3rd century BCE. T. W. Rhys Davids in his book Buddhist India, and Wilhelm Geiger in his book Pāli Literature and Language, suggested that Pali may have originated as a lingua franca or common language of culture among people who used differing dialects in North India, used at the time of the Buddha and employed by him. Another scholar states that at that time it was "a refined and elegant vernacular of all Aryan-speaking people". Modern scholarship has not arrived at a consensus on the issue; there are a variety of conflicting theories with supporters and detractors. After the death of the Buddha, Pali may have evolved among Buddhists out of the language of the Buddha as a new artificial language. R. C. Childers, who held to the theory that Pali was Old Magadhi, wrote: "Had Gautama never preached, it is unlikely that Magadhese would have been distinguished from the many other vernaculars of Hindustan, except perhaps by an inherent grace and strength which make it a sort of Tuscan among the Prakrits." According to K. R. Norman, it is likely that the viharas in North India had separate collections of material, preserved in the local dialect. In the early period it is likely that no degree of translation was necessary in communicating this material to other areas. Around the time of Ashoka there had been more linguistic divergence, and an attempt was made to assemble all the material. It is possible that a language quite close to the Pali of the canon emerged as a result of this process as a compromise of the various dialects in which the earliest material had been preserved, and this language functioned as a lingua franca among Eastern Buddhists in India from then on. Following this period, the language underwent a small degree of Sanskritisation (i.e., MIA bamhana > brahmana, tta > tva in some cases). According to A. K. Warder, the Pali language is a Prakrit language used in a region of Western India. Warder associates Pali with the Indian realm (janapada) of Avanti, where the Sthavira nikāya was centered. Following the initial split in the Buddhist community, the Sthavira nikāya became influential in Western and South India while the Mahāsāṃghika branch became influential in Central and East India. Akira Hirakawa and Paul Groner also associate Pali with Western India and the Sthavira nikāya, citing the Saurashtran inscriptions, which are linguistically closest to the Pali language. Pali died out as a literary language in mainland India in the fourteenth century but survived elsewhere until the eighteenth. Today Pali is studied mainly to gain access to Buddhist scriptures, and is frequently chanted in a ritual context. The secular literature of Pali historical chronicles, medical texts, and inscriptions is also of great historical importance. The great centers of Pali learning remain in the Theravada nations of Southeast Asia: Burma, Sri Lanka, Thailand, Laos, and Cambodia. Since the 19th century, various societies for the revival of Pali studies in India have promoted awareness of the language and its literature, including the Maha Bodhi Society founded by Anagarika Dhammapala. In Europe, the Pali Text Society has been a major force in promoting the study of Pali by Western scholars since its founding in 1881. Based in the United Kingdom, the society publishes romanized Pali editions, along with many English translations of these sources. In 1869, the first Pali Dictionary was published using the research of Robert Caesar Childers, one of the founding members of the Pali Text Society. It was the first Pali translated text in English and was published in 1872. Childers' dictionary later received the Volney Prize in 1876. The Pali Text Society was founded in part to compensate for the very low level of funds allocated to Indology in late 19th-century England and the rest of the UK; incongruously, the citizens of the UK were not nearly so robust in Sanskrit and Prakrit language studies as Germany, Russia, and even Denmark. Even without the inspiration of colonial holdings such as the former British occupation of Sri Lanka and Burma, institutions such as the Danish Royal Library have built up major collections of Pali manuscripts, and major traditions of Pali studies. Nearly every word in Pāḷi has cognates in the other Middle Indo-Aryan languages, the Prakrits. The relationship to Vedic Sanskrit is less direct and more complicated; the Prakrits were descended from Old Indo-Aryan vernaculars. Historically, influence between Pali and Sanskrit has been felt in both directions. The Pali language's resemblance to Sanskrit is often exaggerated by comparing it to later Sanskrit compositions – which were written centuries after Sanskrit ceased to be a living language, and are influenced by developments in Middle Indic, including the direct borrowing of a portion of the Middle Indic lexicon; whereas, a good deal of later Pali technical terminology has been borrowed from the vocabulary of equivalent disciplines in Sanskrit, either directly or with certain phonological adaptations. Post-canonical Pali also possesses a few loan-words from local languages where Pali was used (e.g. Sri Lankans adding Sinhala words to Pali). These usages differentiate the Pali found in the Suttapiṭaka from later compositions such as the Pali commentaries on the canon and folklore (e.g., commentaries on the Jataka tales), and comparative study (and dating) of texts on the basis of such loan-words is now a specialized field unto itself. Comparable to Ancient Egyptian, Latin or Hebrew in the mystic traditions of the West, Pali recitations were often thought to have a supernatural power (which could be attributed to their meaning, the character of the reciter, or the qualities of the language itself), and in the early strata of Buddhist literature we can already see Pali dhāraṇīs used as charms, as, for example, against the bite of snakes. Many people in Theravada cultures still believe that taking a vow in Pali has a special significance, and, as one example of the supernatural power assigned to chanting in the language, the recitation of the vows of Aṅgulimāla are believed to alleviate the pain of childbirth in Sri Lanka. In Thailand, the chanting of a portion of the Abhidhammapiṭaka is believed to be beneficial to the recently departed, and this ceremony routinely occupies as much as seven working days. There is nothing in the latter text that relates to this subject, and the origins of the custom are unclear. Tato naṁ dukkhaṁ anveti, cakkaṁ'va vahato padaṁ. Ta-to naṁ dukkhaṁ anv-e-ti, cakkaṁ 'va vahat-o pad-aṁ. That-from him suffering after-go-3.sg.pr., wheel as carrying(beast)-m.sg.gen. foot-n.sg.acc. The Indo-Aryan languages are commonly assigned to three major groups: Old, Middle and New Indo-Aryan. The classification reflects consecutive stages in a common linguistic development, but is not merely a matter of chronology: Classical Sanskrit, as a codified derivate of Vedic Sanskrit, remains mostly representative of the Old Indo-Aryan stage, even though it continued to flourish at the same time as the Middle Indo-Aryan languages. Conversely, a number of the morphophonological and lexical features of the Middle Indo-Aryan languages show that they are not direct continuations of Rigvedic Sanskrit, the main base of Classical Sanskrit. Instead they descend from other dialects similar to, but in some ways more archaic than Rigvedic. Pali and Sanskrit are very closely related and the common characteristics of Pali and Sanskrit were always easily recognized by those in Nepal who were familiar with both. A very large proportion[clarification needed] of Pali and Sanskrit word-stems are identical in form, differing only in details of inflection. Emperor Ashoka erected a number of pillars with his edicts in at least three regional Prakrit languages in Brahmi script, all of which are quite similar to Pali. Historically, the first written record of the Pali canon is believed to have been composed in Sri Lanka, based on a prior oral tradition. As per the Mahavamsa (the chronicle of Sri Lanka), due to a major famine in the country Buddhist monks wrote down the Pali canon during the time of King Vattagamini in 100 BCE. The transmission of written Pali has retained a universal system of alphabetic values, but has expressed those values in a stunning variety of actual scripts. Since the 19th century, Pali has also been written in the Roman script. An alternate scheme devised by Frans Velthuis, called the Velthuis scheme (see § Text in ASCII) allows for typing without diacritics using plain ASCII methods, but is arguably less readable than the standard IAST system, which uses diacritical marks. There are several fonts to use for Pali transliteration. However, older ASCII fonts such as Leedsbit PaliTranslit, Times_Norman, Times_CSX+, Skt Times, Vri RomanPali CN/CB etc., are not recommendable, they are deprecated, since they are not compatible with one another, and are technically out of date. Instead, fonts based on the Unicode standard are recommended. Acariya is a Garamond style typeface derived from Guru (regular, italic, bold, bold italic). Balava is a revival of Baskerville derived from Libre Baskerville (regular, italic, bold, bold italic). Guru is a condensed Garamond style typeface designed for economy of copy-fit. A hundred A4 pages of text set in Pali would be about 98 pages if set in Acariya, 95 if set in Garava or Times New Roman, but only 90 if set in Guru. (regular, italic, bold, bold italic styles). Hari is a hand-writing script derived from Allura by Robert E. Leuschke. (Regular style only). Jivita is an original Sans Serif typeface for body text. (regular, italic, bold, bold italic). Mahakampa is a hand-writing script derived from Great Vibes by Robert E. Leuschke. Regular type style. Nacca is a hand-writing script derived from Dancing Script by Pablo Impallari and released on Font Squirrel. Regular type style. Open Sans is a Sans Serif font suitable for body text. Ten type styles. Talapanna is a clone of Goudy Bertham, with decorative gothic capitals and extra ligatures in the Private Use Area. Regular and bold styles. ^ Nagrajji (2003) "Pali language and the Buddhist Canonical Literature". Agama and Tripitaka, vol. 2: Language and Literature. ^ Hammarström, Harald; Forkel, Robert; Haspelmath, Martin, eds. (2017). "Pali". Glottolog 3.0. Jena, Germany: Max Planck Institute for the Science of Human History. ^ Hazra, Kanai Lal. Pāli Language and Literature; a systematic survey and historical study. D.K. Printworld Lrd., New Delhi, 1994, page 19. ^ a b Bhikkhu Bodhi, In the Buddha's Words. Wisdom Publications, 2005, page 10. ^ Oberlies, Thomas (2001). Pāli: A Grammar of the Language of the Theravāda Tipiṭaka. Indian Philology and South Asian Studies, v. 3. Berlin: Walter de Gruyter. p. 6. ISBN 3-11-016763-8. "Pāli as a MIA language is different from Sanskrit not so much with regard to the time of its origin than as to its dialectal base, since a number of its morphonological and lexical features betray the fact that it is not a direct continuation of Ṛgvedic Sanskrit; rather it descends from a dialect (or a number of dialects) which was (/were), despite many similarities, different from Ṛgvedic." ^ a b "181  - The home of the Paisaci - The home of the Paisaci - Page - Zeitschriften der Deutschen Morgenländischen Gesellschaft - MENAdoc – Digital Collections". menadoc.bibliothek.Uni-Halle.de. Retrieved 14 April 2019. ^ "An Unpublished Fragment of Paisachi - Sanskrit - Pali". Scribd. Retrieved 14 April 2019. ^ Buddhist India, ch. 9 Retrieved 14 June 2010. ^ Hazra, Kanai Lal. Pāli Language and Literature; a systematic survey and historical study. D.K. Printworld Lrd., New Delhi, 1994, page 11. ^ Hazra, Kanai Lal. Pāli Language and Literature; a systematic survey and historical study. D.K. Printworld Lrd., New Delhi, 1994, pages 1-44. ^ Hazra, Kanai Lal. Pāli Language and Literature; a systematic survey and historical study. D.K. Printworld Lrd., New Delhi, 1994, page 29. ^ Hazra, Kanai Lal. Pāli Language and Literature; a systematic survey and historical study. D.K. Printworld Lrd., New Delhi, 1994, page 20. ^ K. R. Norman, Pāli Literature. Otto Harrassowitz, 1983, pages 1-7. ^ David Kalupahana, Nagarjuna: The Philosophy of the Middle Way. SUNY Press, 1986, page 19. The author refers specifically to the thought of early Buddhism here. ^ a b Oberlies, Thomas (2007). "Chapter Five: Aśokan Prakrit and Pāli". In Jain, Danesh; Cardona, George. The Indo-Aryan Languages. Routledge. p. 163. ISBN 978-1-135-79711-9. Müller, Edward (1995) [First published 1884]. Simplified Grammar of the Pali Language. Asian Educational Services. ISBN 81-206-1103-9. Silva, Lily de (1994). Pali Primer (first ed.). Vipassana Research Institute Publications. ISBN 81-7414-014-X. Warder, A. K. (1991). Introduction to Pali (third ed.). Pali Text Society. ISBN 0-86013-197-1. Andersen, Dines (1907). A Pali Reader. Copenhagen: Gyldendalske Boghandel, Nordisk Forlag. p. 310. Retrieved 29 September 2016. Perniola, V. (1997). Pali Grammar, Oxford, The Pali Text Society. Buddhadatta Mahāthera, A. P. (1958). Concise Pāli-English Dictionary.